The FLEX-1500 utilizes a USB driver for communicating with your PC. There are two functional components of this driver; the USB Kernel mode component and the hardware specific or FLEX-1500 component. These are automatically installed using the PowerSDR 2.x Installer program. You can verify that both driver components have been properly installed by checking for them in the Windows Device Manager. Use the procedure below to verify that your FlexRadio USB driver for the FLEX-1500 is properly installed. NOTE: In this example Windows XP is the operating system. The process is the same for Vista and Win7, except some of the screens and the location of the icons may be different. Before starting this procedure, make sure the FLEX-1500 is connected to the PC and powered up. Step 1. Click on the START button in the lower left hand corner of your screen. Move your cursor to My Computer and right click your mouse to display the My Computer sub-menu. If using the classic view, right click your mouse on the My Computer icon on the desktop. Step 2. Move your cursor to the Properties option and right click your mouse to display the System Properties dialog box. Step 3. Once the System Properties dialog box is displayed right click your mouse on the Hardware tab to display the System Properties Hardware Option screen. Step 4. Left click your mouse on the Device Manager button to display the Device Manager dialog box. Step 5. Look for the hardware category FlexRadio. If this subcategory is not displayed the FlexRadio USB driver has not been installed. If the hardware category FlexRadio is present, expand it by clicking on the [+] to the left of it. Step 6. 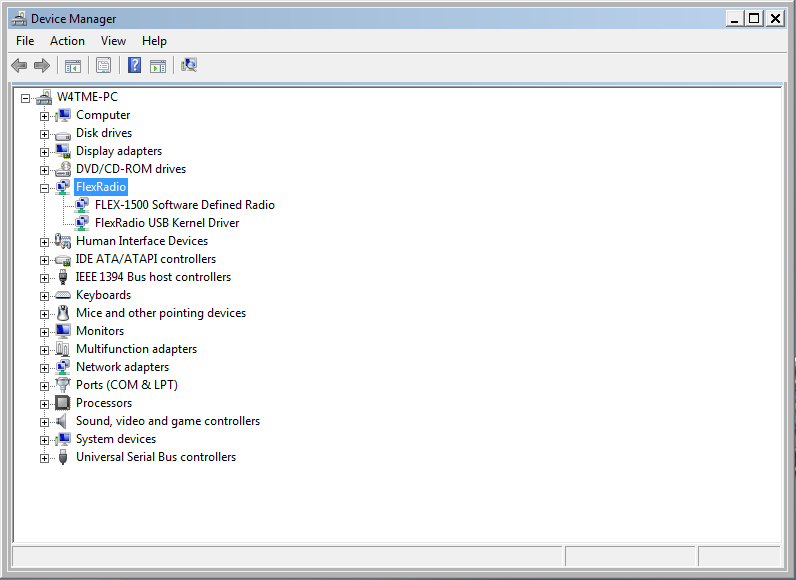 As noted in the picture above taken from the Device Manager screen, there are two components listed under the FlexRadio hardware category. The FlexRadio USB Kernel Driver device is the low level driver that is responsible for low-latency radio control and with a properly installed FLEX-1500 USB driver, it will always be displayed even if the FLEX-1500 is not attached and powered up. The FLEX-1500 Software Defined Radio device is the high level device specific portion of the low-latency radio control driver. This is the actual FLEX-1500 connected to your PC. Both of these drivers work together to provide hardware control of the radio from the PC. If both of these driver components are displayed, then the driver is installed correctly and the FLEX-1500 is properly communicating with the PC. If the FLEX-1500 Software Defined Radio and the FlexRadio USB Kernel Driver entries are not displayed, then the FLEX-1500 driver did not load properly and will have to be reloaded. If the FLEX-1500 Software Defined Radio component is not displayed, then either the FLEX-1500 is not connected to the PC, it is not powered up or there is another issue preventing the radio hardware from communicating with the PC. Check the USB connections and the power on state of the radio. You also may have to connect the FLEX-1500 to a different USB port. Article has been viewed 19,027 times. Execution: 0.453. 9 queries. Compression Disabled.